Ice hockey in Northern Ireland dates back to 1939 with games played against a backdrop of World War Two featuring sides from Shorts and Harland and Wolff. On 2nd December 2000, a new era of ice hockey began in Belfast, Co. Antrim as the Belfast Giants took to the ice in the new Odyssey Arena on Queen's Island. Across the country, there was excitement about the arrival of this "new" game but ice hockey in Northern Ireland goes back a long way. During the 1930s and 1940s, ice hockey was popular with games played in front of huge crowds in the King’s Hall, Belfast, Co. Antrim. The action continued on the ice throughout the years of World War Two and up until the onset of a more modern conflict in 1969. Before the custom built ice rink at the King’s Hall, roller hockey was popular with working class children in Belfast’s streets. Informal competitions took place at Dunmore Park, Antrim Road, Belfast, Co. Antrim. Ireland’s Saturday Night newspaper also noted roller hockey events at Palm Hall, Tamar Street, Belfast, Co. Antrim. As popularity grew, so did the demand for a dedicated venue. 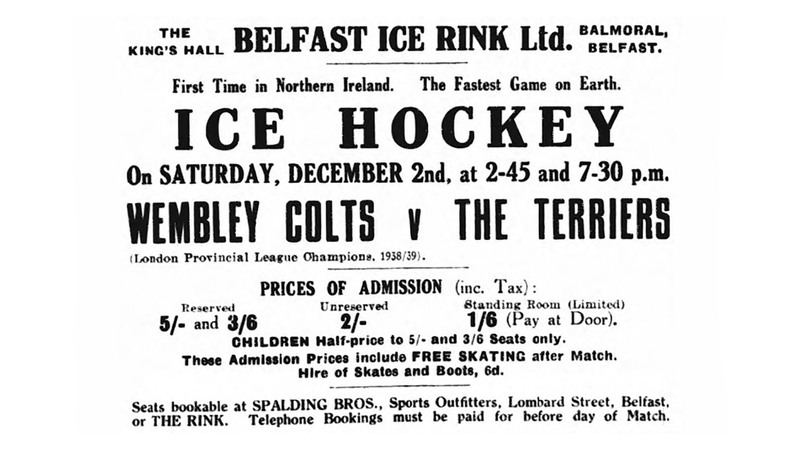 A newspaper advert taken from the Belfast Telegraph in December 1939 promotes an upcoming game of ice hockey between two London teams in the new rink at King's Hall, Belfast, Co. Antrim. Copyright Belfast Telegraph. In June 1933, the Royal Ulster Agricultural Society built a large indoor arena in South Belfast. The King’s Hall opened to the public on 29th May 1934 at a cost of £61,139. The Belfast Ice Rink opened to the public at the King’s Hall on 4th October 1939. Local newspapers reported that over 1,000 skaters “besieged the building” on the opening night. A Canadian named Arnold “Duke” Brockman was the first manager of the rink. He became ice hockey’s first pioneer in Northern Ireland, taking on the role of coach, referee, and promoter. Relationships formed due to migration between Northern Ireland and Canada helped to increase the popularity of the sport. Another major contributing factor was the contribution of Belfast’s heavy industries. Two of the main teams involved in the early days of the sport came from Harland and Wolff Shipyard and the Short and Harland Aircraft Factory. Many supposed ice hockey to be a game for the Unionist population of the city. Links to English teams and Canadian nationals suggested links with the British Empire. Many of the men from the factories were from Protestant working class areas and the arena was in an affluent part of the south of the city. “God Save The Queen” played at the end of games and skating session. Ice hockey in the 1930s and 1940s was not a sectarian sport however. Many from a Nationalist background took part in games with the Northend Racers based in North Belfast. Newspaper archive photo: The Earls Court Redwings line up to face the Earls Court Marlboroughs in King's Hall, Belfast on 16th December 1939. Copyright The Northern Whig. 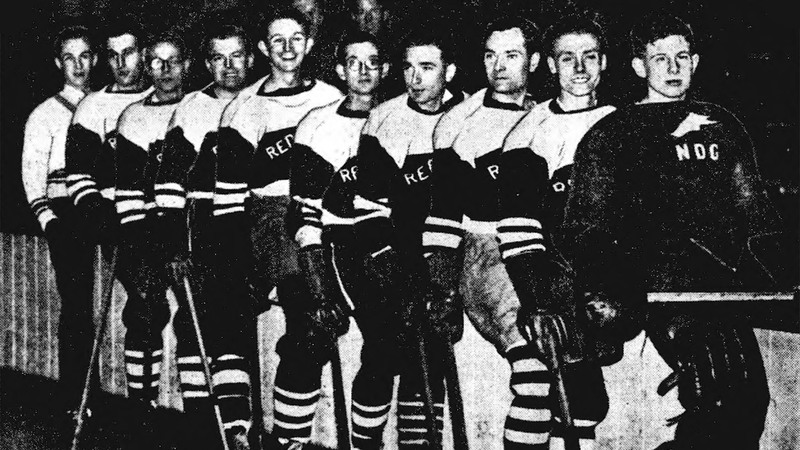 Following the outbreak of World War Two, ice hockey in Northern Ireland suffered several setbacks. The workers at Harland and Wolff and Short and Harland found themselves engaged in new work constructing machinery for the war effort. The King’s Hall itself became a base for British army troops before use by Short and Harland as a location for repairing Stirling bombers. The hall reopened to the public in 1946. Many of the local players also found themselves enlisting for the services. Ice hockey in Northern Ireland would go through many more good times and bad, long before the Belfast Giants skated into town. Balmoral Tigers and Short and Harland Raiders faced off in King's Hall, Belfast, Co. Antrim on 3rd February 1940 in an ice hockey game betwen local teams. The King's Hall, Belfast, Co. Antrim "home" team Balmoral Tigers defeated Thornton Wasps 7-2 in the Northern Ireland Ice Hockey League on 9th March 1940. If you enjoyed this post on "Wartime ice hockey in Northern Ireland", please share with your friends and followers.